Am I #1 in Google Yet? There are times when we get some form of the question, “Am I #1 in Google yet?” This is a legitimate question, but also a tough one to answer because although it sounds simple, there isn’t an easy “yes” or “no” answer. Although a small piece of the larger inbound marketing strategy, Search Engine Optimization – and primarily Google stats – get a lot of attention from our clients. The Possibilities are Endless – anyone can be #1 in Google, just like that promising first date could turn out to be the love of your life. There are Many Ups and Downs – a dating relationship and Search Engine Optimization with Google are both comprised of the ups and downs of building any relationship on a daily basis. It Could Go South At Any Moment – a dating relationship and a Google relationship carry no guarantees. It could go really, really well or it could suddenly implode, leaving you with a big mess through no fault of your own (for example, losing 70 Google Places reviews). It Can Turn into a Long-Term Commitment – dating and SEO with Google have the same end game, which is to build a long-lasting relationship to improve the quality of life (or business). Then the Real Work Begins – once dating turns into marriage, you don’t get to sit back and relax; marriage, like Google placement, requires consistent work over time to bring about the best results. So why is Search Engine Optimization (SEO) and Google placement so important? Let’s say you have a website, and you want to use that little piece of the internet you now own to drive people to your small business. How will they find you on the internet? Probably by using a search engine like Google, Bing or Yahoo. Search Engine Optimization capitalizes on key words related to your business and website to help you gain traction in these search engines, placing your business as close to the beginning of a search as possible. Think of the internet as an old-school phone book or library, and a business owner structuring a small business name around the letter A so that the business would appear in the front of the section relevant to the business. An example might be “A1 Duct Cleaning” in the Home Maintenance and Repair section, which in the phone book system would get the first spot. Although Search Engine Optimization doesn’t work alphabetically in that same way, there’s still method to the madness when it comes to how people search the internet for information. Figuring out what key words link your small business to the internet is a simple and powerful way to gain attention from Google and additional search engines, providing a really cost-effective way to get those potential and current patients to your website. Search Engine Optimization is a service that we provide for our clients at Verticalwerks over a long period of time with the goal of getting each one as high in the search results as possible for certain key words. Not chemistry. Not common backgrounds and experiences. Not even love. The success of a relationship (my professor claimed) was whether or not two people remained in close geographical contact. If you think about the internet as a whole and just how many people might search for information each hour (not to mention each day), it can be pretty overwhelming. So there are two categories for SEO key words – Global Search and Local Search. This distinction might not seem like much on the surface, but it’s what keeps us from getting results for dentists in Maine when we search for “Dentist in Portland” on this side of the continent. Local search engine optimization helps narrow the focus, providing more power when it comes to how we use the key words that are right for your business. Dr. Randy Morgan of Newberg Family Dental is one of our long-time clients who understands his relationship with Google regarding search engine optimization for his practice. 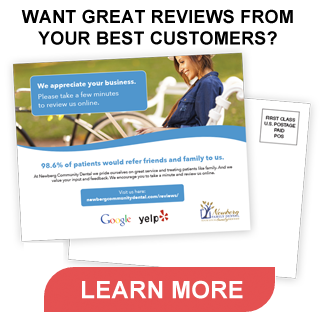 Formerly at the bottom of the list, Newberg Family Dental is the #1 search result in Google for “Dentist in Newberg.” While this is great news, the efforts can’t stop there – Dr. Morgan continues search engine optimization for these key words not just to make it there and call it good, but to stay there.